Museo Storico Alfa Romeo (Alfa Romeo Historical Museum; subsequently called Museo Alfa Romeo - La macchina del tempo, literally Alfa Romeo Museum - The time machine) is Alfa Romeo's official museum, located in Arese (Milan), and displaying a permanent collection of Alfa Romeo cars and engines. After being closed down in 2011, the museum reopened in June 2015. The museum was officially inaugurated on 18 December 1976, and is located in the former Alfa Romeo Arese factory area. Production of cars ended in 2002 and engine production in 2006 in Arese factory complex. At the beginning of 2009 the museum was closed down a first time for renovations and opened in the end of the year, to celebrate Alfa Romeo’s 100th birthday in 2010. 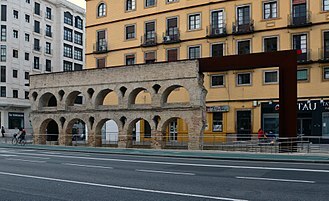 It was closed once more in February 2011, reportedly for renovation work again. The renovation project was laid down at the end of 2013, and restoration work only started in Summer 2014. Centerpiece of the renewed structure are Alfa red projecting roofs added to the original 1970s structure. After four years the Museum officially reopened on 24 June 2015, when it hosted the press unveiling of the all-new Alfa Romeo Giulia and Alfa Romeo logo, both key steps in the relaunch of the brand. 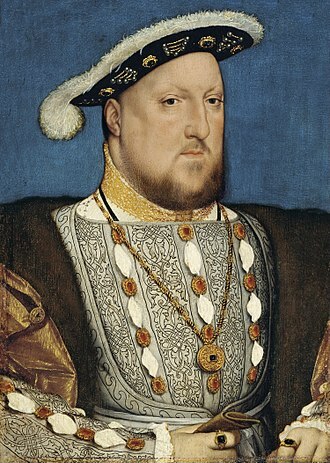 On 30 June 2015 the museum reopened to the public. The museum is dedicated to over 100 years of history of the Alfa Romeo marque, whose production included automobiles, commercial vehicles, railway locomotives, tractors, buses, trams, marine and aircraft engines. The museum spreads over 4,800 square metres (52,000 sq ft). Its six floors are divided into four theme areas, including a historical review of all Alfa Romeo road cars produced since 1910, prototypes and dream cars, aircraft and aeronautical projects, and scale models and awards. The museum collection numbers over 250 cars and 150 engines, of which approximately half were on display. These included at least one example of each model produced, plus prototypes and racing cars. Some of the museum cars are regularly on loan for festivals and historical events, like Pebble Beach Concours d'Elegance, the Goodwood Festival of Speed and Mille Miglia. The renewed 2015 exhibit includes 69 cars. 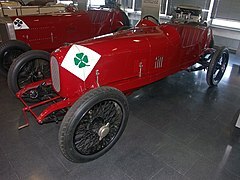 Scuderia del Portello is an Italian sports association dedicated to the activities of Alfa Romeo cars and historic models in motorsport and rallies; the official club is located at the Alfa Romeo Museum in Arese. On February 3, 1982, the journalist Luca Grandori, together with Edilberto Mandelli, Pietro Rondo, Giorgio Schoen, Stefano Senin and Renato Ughi, founded the Scuderia in Arese as part of the Centro Direzionale Alfa Romeo with the patronage of the mother company. The name recalled the suburbs of Milan where the company’s first factories were built. The Scuderia was conceived as a structure for giving support and technical assistance to drivers racing Alfa Romeo cars which were no longer in production, but the articles of association stated that its aim was also to promote the brand, as well as to safeguard its historical and technological heritage, as a contribution to the history of car racing. It immediately became the official Alfa Romeo team for historical car races. In 1990 Scuderia del Portello changed its statute and broadened its activity to also include modern racing cars, becoming an official club of the communication of the brand management. On that occasion the logo was changed as well, taking on its present appearance which recalls the form of the Alfa Romeo 1900 radiator. The current president and team principal is Marco Cajani. In addition to the titles won under the aegis of the FIA, Scuderia del Portello has won eight Italian Historic Car Championships, and over 300 overall class victories in historical car races both in European and National championships. In 1997 the Scuderia won the Tour Auto (revival of the Tour de France Automobile) with Cajani-Faraci (Alfa Romeo Giulietta Sprint Veloce), and in 2004, 2006, and 2007 the Tour de España, respectively with Jean Sage (Alfa Romeo Giulietta Ti), Sage-Entremont (Alfa Romeo 1900 Ti) and Cajani-Confaloni (Alfa Romeo 1900 CSS Zagato). The Scuderia took part in the commemorations of important historical races such as the Carrera Panamericana (1990, 1991, 2002), where in 1991 it was awarded “best participating team”, and in 2002 won in the Sport Menor category with Arturo Merzario and Vinicio Marta (Alfa Romeo Giulietta Spider Veloce), and in the Original Panamericana category with Prisca Taruffi and Antonio Maglione (Alfa Romeo Giulietta Sprint Veloce). 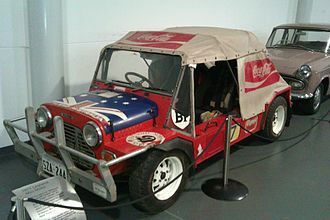 The Scuderia took part in two editions of the London–Sydney Marathon (1993 and 2000) and in the Peking to Paris in 2007. In 2004 it was the only racing team to take part in all six classes at Le Mans Classic, the historical reconstruction of the 24 Hours of Le Mans, and with Phil Hill it gained class victory with an Alfa Romeo 6C 3000 CMM. In Italy, Scuderia del Portello members and cars usually participate in commemorations of the historical Mille Miglia and Targa Florio. The Scuderia has achieved relevant results with modern racing cars too, including a Drivers and Constructors Championship ISCS International Series (Group N), an Italian Superproduction Championship, two CIVT Italian Touring Car Championships (Group N), an ETCS Superdiesel Challenge (Class up to 2.5cc), two Italian Cups for women, one victory in the Alfa Romeo Challenge, a class victory at the 24 Hours Nürburgring and two victories in the Italian Superturismo Championship (Private trophies). ^ a b "Museo Storico Alfa Romeo". tafter.it (in Italian). Archived from the original on 20 February 2009. Retrieved 16 January 2009. ^ a b c d e f "Alfa Romeo, parte il grande rilancio: nuovo marchio, riapre il museo di Arese" [Alfa Romeo, the great relaunch begins: new logo, the Arese museoum reopens]. ilmessaggero.it (in Italian). 25 June 2015. Retrieved 26 June 2015. ^ a b "Alfa Romeo Museum". alfaromeo.com. Archived from the original on 2013-01-15. Retrieved 9 April 2012. ^ "Museo Alfa Romeo—Chiuso per manutenzione" [Alfa Romeo Museum—Closed down for maintenance]. 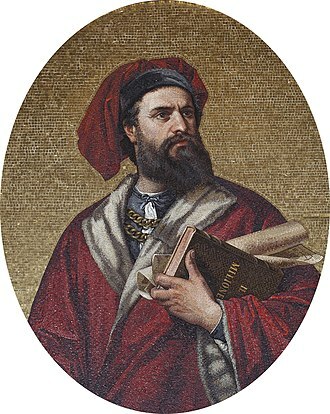 quattroruote.it (in Italian). 10 February 2011. Retrieved 26 June 2015. ^ Scuderia del Portello - History Scuderiadelportello.org. Retrieved 17 April 2016. 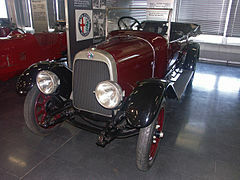 Wikimedia Commons has media related to Museo Storico Alfa Romeo. The Alfa Romeo Arese Plant was a plant area where Alfa Romeo had its head office for more than two decades prior to 1986 was known to be. After Fiat Group purchased Alfa Romeo in 1986, Arese became one of the plants of Fiat Group. The factory is in the Province of Milan in the Italian region Lombardy, the factory became known as the Arese plant only because the main entrance is in the municipality of Arese. Today the factory is almost totally closed and abandoned, since the Alfa Romeo owners have almost completely moved design, the companys final manufacturing activities at Arese ended in 2005 when the Alfa Romeo V6 engine production stopped in Arese. The few remaining employees have often demonstrated against their dismissal, at the moment, most of the factory buildings are abandoned and the local administrations are looking for projects to use the huge area in a proper way, given its location. Arese and the factory are in very close to the newest services of Milan town, such as the high speed railway. The Alfa Romeo Giulietta Sprint Speciale and Alfa Romeo Giulia Sprint Speciale, known as Giulietta SS and Giulia SS, are small sports cars manufactured by Alfa Romeo from 1959 to 1966. The first prototype of the Giulietta SS was presented in 1957 at the Turin Motor Show, after two more prototypes were presented in car shows, the official presentation of the production version for the press was on 24 June 1959 on the Monza race track. The first 101 cars produced had low nose and 750 SS designation,100 cars minimum were needed to homologate a car in FIA regulations. While there were some all-aluminium cars produced, the majority of cars had steel bodies with aluminium doors, engine bonnet. Also first cars were equipped with Weber 40 DCO3 carburettors, changed to 40 DCOE2, the drag coefficient of the Sprint Speciale is 0.28, the same as a Chevrolet Corvette, and was not surpassed for more than twenty years. Cars used the 1,290 cc Alfa Romeo Twin Cam engine, small changes to a production version included steel doors, Weber 40 DCOE2 carburetors, higher front nose, removal of plexiglas windows. Bumpers were fitted front and rear, cars had some minimal sound-proofing, with the 1290 cc engine and 100 hp of power the maximum speed was around 200 km/h. The 1.3 litre engine and gearbox was the same as used in race-oriented Giulietta Sprint Zagato, all Giuliettas SS had three-shoe drum brakes at front wheels and drum brakes at the rear. Side badges had Giulietta Sprint Speciale script, Giulia Sprint Speciale Bertone Prototipo The bigger engine 1.6 L Giulia series replaced the Giulietta and was introduced at the March 1963 Geneva Motor Show. As Giulietta is the diminutive for Giulia in Italian, the new Giulia name was a wordplay hinting that the new car was a version of the Giulietta. In spite of a Giulia SS prototype, Alfa Romeo decided to retain the Giulietta-shaped SS in production, the 1, 570cc engine made up to 200 km/h possible. The 1, 570cc engine with Weber 40 DCOE2 carburetors was taken from Giulia Sprint Veloce, most Giulia SS had disc brakes at front wheels. An easy way to distinguish the Giulia SS from the Giulietta SS is by the dashboard, the Giulia has a leather underside with the glovebox at a different angle than the main fascia. 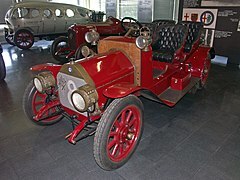 Tour de France Automobile was a sports car race held on roads around France regularly – mostly annually – between 1899 and 1986. The first edition was held in 1899 at speeds of 30 mph, the first event was won by René de Knyff driving a Panhard et Levassor. 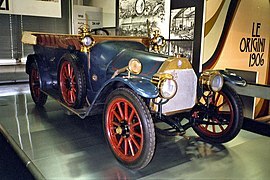 Out of 49 starters,21 vehicles finished, the 1908 event was won by Clément-Bayard. The 1951 event was won by Pagnibon-Barracquet in a 2. 6-litre Ferrari, the event visited La Turbie Hill Climb, near Nice. In 1954 the event was won by the 2.5 litre Gordini of Jacques Pollet and M. Gauthier, the 1956 event was won by de Portago/Nelson in a Ferrari 2502.9 with Moss/Houel in second place. 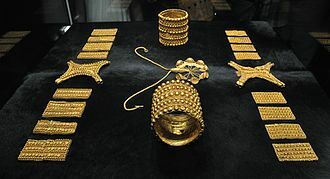 The 1960 Tour de France took place between September 15 and 23 that year, starting at Nice it visited Mont Ventoux, Spa, Montlhéry, Rouen and Le Mans with the finish at Clermont Ferrand. The event was won overall by the Ferrari 250 G. T. of Willy Mairesse/Georges Berger, the Jaguar 3.8 litre Mk. II of Bernard Consten/J. Renel won the Touring category with the BMW700 coupé of Metternich/Hohenlohe winning the Index of Performance, the 1964 event was won by Lucien Bianchi/Georges Berger in a Ferrari GTO, entered by Ecurie Nationale Belge. It was unveiled as ES-30 in 1989 Geneva Motor Show as a prototype by Zagato, although the car was mainly built by them - not designed mechanically. Robert Opron of the Fiat design studio was responsible for the sketches while Antonio Castellana was largely responsible for the final styling details. Only the Z logo of Zagato was kept, the car possessed unusual headlights positioned in a trio on each side - a styling used more subtly on Alfa Romeos in the 2000s. Mechanically and engine-wise, the car was based on the Alfa Romeo 75, the thermoplastic injection moulded composite body panels were produced by Italian company Carplast and French company Stratime Cappelo Systems. The suspension was taken from the Alfa 75 group A/IMSA car, a hydraulic damper system was made by Koni. The two-seater hard roof version saw a version, the RZ. Although almost identical to look at the two cars had different body panels save for the front wings and boot. The RZ had a revised bumper and door sills to give ground clearance. The Mille Miglia was an open-road endurance race which took place in Italy twenty-four times from 1927 to 1957. Like the older Targa Florio and the Carrera Panamericana, the MM made Gran Turismo sports cars like Alfa Romeo, BMW, Maserati, Mercedes Benz, the race brought out an estimated five million spectators. From 1953 until 1957, the Mille Miglia was a round of the World Sports Car Championship, since 1977, the Mille Miglia has been reborn as a regularity race for classic and vintage cars. Participation is limited to cars, produced no than 1957, the route is similar to that of the original race, maintaining the point of departure / arrival in Viale Venezia in Brescia. This made organisation simpler as marshals did not have to be on duty for as long a period, from 1949, cars were assigned numbers according to their start time. For example, the 1955 Moss/Jenkinson car, #722, left Brescia at 07,22, in the early days of the race, even winners needed 16 hours or more, so most competitors had to start before midnight and arrived after dusk - if at all. The race was established by the young Count Aymo Maggi and Franco Mazzotti, together with a group of wealthy associates, they chose a race from Brescia to Rome and back, a figure-eight shaped course of roughly 1500 km — or a thousand Roman miles. Later races followed twelve other routes of varying total lengths, the first race started on 26 March 1927 with seventy-seven starters — all Italian — of which fifty-one had reached the finishing post at Brescia by the end of the race. The first Mille Miglia covered 1,618 km, corresponding to just over 1,005 modern miles, entry was strictly restricted to unmodified production cars, and the entrance fee was set at a nominal 1 lira. The winner, Giuseppe Morandi, completed the course in just under 21 hours 5 minutes, averaging nearly 78 km/h in his 2-litre OM, tazio Nuvolari won the 1930 Mille Miglia in an Alfa Romeo 6C. Having started after his teammate and rival Achille Varzi, Nuvolari was leading the race, in the dim half-light of early dawn, Nuvolari tailed Varzi with his headlights off, thereby not being visible in the latters rear-view mirrors. The Targa Florio was an open road endurance automobile race held in the mountains of Sicily near Palermo. Founded in 1906, it was the oldest sports car racing event, after 1973, it was a national sports car event until it was discontinued in 1977 due to safety concerns. It has since run as a rallying event, and is part of the Italian Rally Championship. 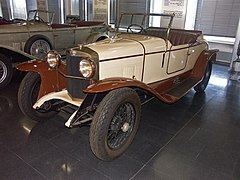 The race was created in 1906 by the wealthy pioneer race driver and automobile enthusiast, Vincenzo Florio, alessandro Cagno won the inaugural 1906 race in nine hours, averaging 30 miles per hour. By the mid-1920s, the Targa Florio had become one of Europes most important races, Grand Prix races were still isolated events, not a series like todays F1. The wins of Mercedes in the 1920s made a big impression in Germany, especially that of German Christian Werner in 1924, rudolf Caracciola repeated a similar upset win at the Mille Miglia a couple of years later. In 1926, Eliska Junkova, one of the female drivers in Grand Prix motor racing history. In 1953, the FIA World Sportscar Championship was introduced, the Targa became part of it in 1955, when Mercedes had to win 1-2 with the Mercedes-Benz 300 SLR in order to beat Ferrari for the title. They had missed the first two of the 6 events, Buenos Aires and the 12 Hours of Sebring, where Ferrari, Jaguar and Porsche scored. 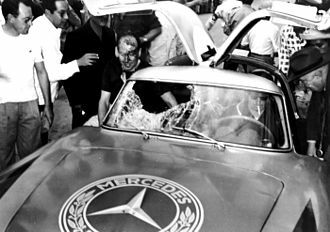 Mercedes appeared at and won in the Mille Miglia, pulled out of Le Mans as a sign of respect for the victims of the 1955 Le Mans disaster, stirling Moss/Peter Collins and Juan Manuel Fangio/Karl Kling finished minutes ahead of the best Ferrari and secured the title. Several versions of the track were used and it started with a single lap of a 148 km circuit from 1906-1911 and 1931. From 1912 to 1914 a tour around the perimeter of Sicily was used, with a lap of 975 kilometres. The 148 km Grande circuit was shortened twice, the first time to 108 km, the version used from 1919-1930. From 1951-1958, the coastal island tour variant was used for a separate event called the Giro di Sicilia. The Alfa Romeo Giulia TZ was a sports car and racing car manufactured by Alfa Romeo from 1963 to 1967. In 2011, the name was reduced from Giulia TZ to TZ in the new TZ3 model, the original TZ, currently sometimes referenced as TZ1 to differ from TZ2, was developed in together with Autodelta, a company led by Ex-Ferrari engineer Carlo Chiti. The result was a lightweight coupé of only 650 kilograms and top speed of 134 miles per hour, the TZ was built both for street and racing trim, with the latest racing versions producing up to 160 brake horsepower. Aiding the TZ in its quest for performance was the treatment of the rear bodywork, incorporating the research of Dr. Wunibald Kamm, the TZ used a style called coda tronca in Italian, meaning short tail. Otherwise known as the Kamm tail, Zagato had previously proved the success of this tail treatment in their coda tronca Sprint Zagato sports-racing cars, and it was a natural evolution to adapt this to the Giulia TZ. The car debuted at the 1963 FISA Monza Cup, where TZs took the first four places in the prototype category, at the beginning of 1964 the TZ was homologated to the Gran Turismo category. After homologation it started to take more class wins in Europe, of the first TZ,112 units were built between 1963 and 1965. Only built as limited amount these TZ models are quite collectibles nowadays, listed price around 150,1,570 cc straight-4 DOHC112 bhp at 6500 rpm,160 bhp In 1965 the car was updated with new fibreglass bodywork providing lower drag and reduced weight. This new version was made by Zagato. The new design was called the Alfa Romeo Giulia TZ2, the TZ2 was only built as racing version, it was equipped with an Autodelta-prepared twin plug, dry sump lubrication 1,570 cc straight-4 DOHC engine producing around 170 brake horsepower at 7000 rpm. With this engine the car reached top speed of 152 miles per hour, the rear window was changed, now single unit rather than three part window in TZ. Development of TZ cars was stopped in the end of 1965, the car won the prestigious Gran Turismo Trophy at the 2009 Pebble Beach Concours dElegance. The TZ3 was built in two forms, celebrating Alfa Romeos centenary in two different heritages, the Alfa Romeo TZ3 Corsa is the track version of the TZ3 built to celebrate 100 years of Alfa Romeo in racing. The Pebble Beach Concours dElegance is an automotive charitable event held each year on the Pebble Beach Golf Links in Pebble Beach, considered the most prestigious event of its kind. 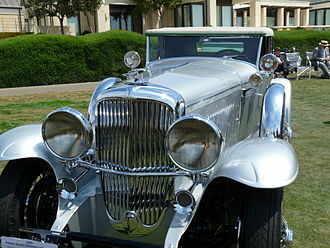 It is the finale of Monterey Car Week held in August every year, a Concours dElegance is an event open to both prewar and postwar collector cars in which they are judged for authenticity, function and style. Classes are commonly arranged by type, coachbuilder, country of origin, judges select first-, second-, and third-place finishers for each class in the event, and the judges confer the Best of Show award on one car from the group of first-place winners. Approximately 15,000 spectators attend the event, the 1950 and 1951 Concours were held on a practice tee and driving range adjacent to the Beach Club, a private club near the Del Monte Lodge. Thirty cars were exhibited on November 4,1950, and a field of 23 on May 27,1951. In 1952, the event was moved to the 18th green of the Pebble Beach Golf Links, the Pebble Beach Concours dElegance has continued since 1950 with one missed year, in 1960, the show was cancelled due to scheduling conflicts. In 2001, the event saw an introduction of a new category for preservation cars and this category was designed to bear witness to the passage of time, including the so-called barn find car. The 2006 event saw 175 cars lining the 18th green and hole of Pebble Beach Golf Links with 25 judged classes, with cars brought to Pebble Beach from 27 states and 13 countries. The event describes itself as Exhibiting prewar and postwar automobiles along with the latest in concept car designs, the Pebble Beach Concours dElegance is the premiere concours in the world. 24 of the 175 cars in the come from outside the U. S, representing Italy, France, Australia, Germany, Czech Republic, Netherlands. The total estimated cost of the vehicles spread across the 18th fairway at the 2006 event was US$200 million, from 227 cars in 2005, the 2006 event had a field reduced to 175 cars. Organizers said the change was made to more time to judge each car. In 2009, the Pebble Beach Concours included classic motorcycles for the first time under the theme of pre-1959 British Motorcycles, the Concours received the 2011 Motoring Event of the Year award by the International Historic Motoring Awards. 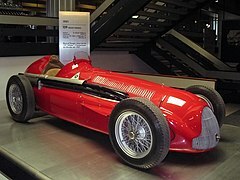 The 2+2 was Alfa Romeos first successful foray into the 1. 3-litre class. The Giulietta series was succeeded by the Giulia in 1962, the first Giulietta to be introduced was the Giulietta Sprint 2+2 coupé at the 1954 Turin Motor Show. Designed by Franco Scaglione at Bertone, it was produced at the coachbuilders Grugliasco plant near Turin, a year later, at the Turin Motor Show in April 1955, the Sprint was joined by the 4-door saloon Berlina. In mid 1955, the open two-seat Giulietta Spider, featuring convertible bodywork by Pininfarina, in 1957 more powerful Berlina version, called Giulietta T. I. was presented with minor cosmetic changes to the hood, the dial lights and rear lamps. Carrozzeria Colli made the Giulietta station wagon variant called Giulietta Promiscua, ninety-one examples of this version were built. Carrozzeria Boneschi made a few station wagon examples called Weekendina, a new version of the Giulietta Berlina debuted at the Frankfurt Motor Show in 1959. 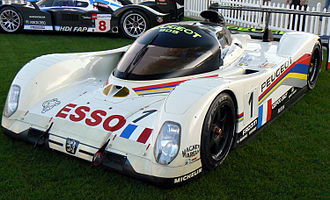 The bodywork showed a front end, with more rounded wings, recessed head lights. The rear showed changes, with new tail lights on vestigial fins. The T. I. received a front side repeater mounted in a small spear, during 1959 the type designation for all models was changed from 750 and 753 to 101. In February 1961 the 100, 001st Giulietta rolled off the Portello factory, in Autumn 1961 the Giulietta was updated a second time. Both Normale and T. I. had revised engines and new exhaust systems, with this new engine the car could reach a speed of almost 160 km/h. At the front of the car square mesh side grilles were now pieced together with the centre shield, inside the T. I. had individual instead of bench seats, with storage nets on the seatbacks. June 1962 saw the introduction of the Alfa Romeo Giulia, which would replace the Giulietta. As until 1964 the Giulia only had a larger 1. 6-litre engine, production of the standard Berlina ended with 1963, a last T. I. was completed in 1965. The Alfa Romeo Giulietta used unibody construction and a front-engine, rear-wheel-drive layout, front suspension was by control arms, with coaxial coil springs and hydraulic dampers. In relation to motorsport governed by the FIA, Group N referred to a set of regulations providing standard production vehicles for competition, often referred to as the Showroom Class. This contrasted with the Group A all-out competition production-derived vehicles, Group N cars are limited in terms of modifications made from standard specification. Group N was introduced by the FIA in 1982 to replace the outgoing Group 1 as standard touring cars. To qualify for homologation, a minimum of 2500 cars of the model had to be built in one year. The Group N regulations were replaced in 2013. No new cars will be homologated under Group A or Group N regulations, the R4 class itself will be gradually phased out. In 2015, the FIA realigned the rally classes yet again, a new class, NR4 has been added, and is identical to the previous Group N class, just with a new name to fit in with the other R names. R4 cars are now not allowed in FIA sanctioned rallies in Europe, while Group A became the standard category for international touring car racing, Group N found a home as a more economic class in national touring car racing. In many countries, there would often be two touring car championships, one for Group A and one for Group N, in Rallying, the Production World Rally Championship was run under Group N rules until 2012. Some local variants of Group N have been created to allow other marques to compete where Group N is the national formula, cars with forced induction engines were fitted with a restrictor in front of the charger to limit power. Originally, Group N meant that all the interior trim had to be present, the springs and dampers were free, as are the internals of the gearbox and the final-drive ratio, providing that the homologated gear ratios and gearchange pattern were respected. This allowed the use of dog-engagement gearboxes, providing quicker gearchanges, there was provision for strengthening of the suspension components and bodyshell, provided this didnt alter the operating principle. The GpN 4WD Turbo rally car category underwent the process of being renamed as R4 for 2011, the key areas were that standard road car bodywork and driven wheels were retained from the road car that could be bought from the showroom. The Mil Mi-8 is the most-produced helicopter in history. The Cessna 172 Skyhawk is the most produced aircraft in history. Voodoo, a modified P 51 Mustang, is the 2014 Reno Air Race Champion. TZ2 at the 2018 Goodwood Festival of Speed. "Low nose" Giulietta Sprint Speciale. Dashboard of a 1961 Giulietta Sprint Speciale. Alfa Romeo Giulia Sprint Speciale, rear view. Alessandro Cagno (1883-1971), winner of first Targa Florio in 1906. 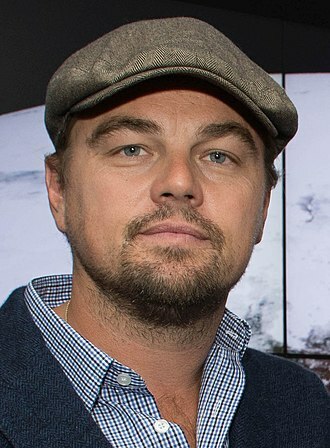 Pictured at 1907 event. Vincenzo Lancia driving a Fiat 50 hp in 1908 Targa Florio, finished 2nd. Porsche 910 2.0 coupé driven by Umberto Maglioli and Udo Schütz in 1967. 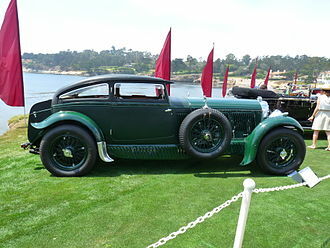 1930 Bentley Speed Six Nutting Coupe, 2009 Concours. This car once belonged to Woolf Barnato, Kimberley diamond heir and three-time winner of the 24 Hours of Le Mans race. On the 18th green with a part of the 2005 Pebble Beach Concours d'Elegance prewar field. Marx/Donà with Alfa Romeo 6C 1750 Gran Sport in 2008 Mille Miglia. With Alfa Romeo engineers. From left, Orazio Satta Puliga, Giuseppe Busso, Giuseppe Luraghi and Carlo Chiti.